Not all injuries are physical. Some of the worst injuries are injuries to the mind. Goldfinger Law acts for accident victims who have sustained psychological or psychiatric claims such as anxiety, post traumatic stress disorder, depression, suicidal ideation, nervous shock, dementia, mood disorder, stress disorder, psychotic disorder, hallucinations, nightmares, fatigue, anger, rage, delusional disorder, personality disorder, adjustment disorder, substance abuse disorder, psychosis, conversion disorder or any other psychological or psychiatric injury caused or exacerbated on account of a personal injury. These psychological disorders require an understanding personal injury lawyer, who knows how to handle these sort of clients and meet their expectations. We also understand that having open dialogue with our clients is very important towards helping them better understand how the legal process works, and how their case is progressing. Goldfinger Law uses expert psychiatrists, psychologists, therapists, social workers, neuropsychologists and other rehabilitation consultations to bring a multi disciplinary approach to these psychological injury cases. We understand that it will take a team of professionals to help prove to the Court, the Judge, the Jury and help the insurer understand the nature of the injury and how it impacts the accident victim's daily life. Because these injuries don't show up on any x-ray or scan, having a strong credible team of experts at your disposal is crucial to any psychological injury case. Over the years, Goldfinger Law has forged relationships with leaders in the field of rehabilitation psychology to assist our clients and help them recover the compensation which they deserve. Psychological Injury can occur as a result of a car accident, pedestrian accident, bike accident, boating accident, slip and fall and can be a part of a larger insurance dispute for long term disability benefits. These injuries can be associated with physical injuries, orthopedic injury, brain injury, spinal cord injury, or they can exist on their own. Our team of personal injury lawyers understand how important these cases are to our clients. No case is the same for us. Every case is unique. 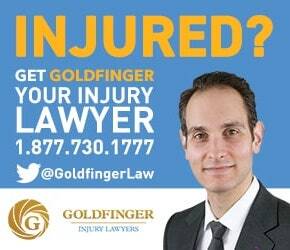 If you or a loved one has fallen victim to a psychological injury as a result of a accident, call the lawyers of Goldfinger Law for your free consultation. All of our consultations are free of charge. We can be reached toll free at 1-877-730-1777 or by email at info@goldfingerlaw.com. 5.0 "I don't think another lawyer would have got me the results Brian did"